Being next door neighbors to the Houston Astros. No one loves baseball season more than our staff and residents. Whether you frequent Astros games on a weekly basis and want the ease of walking directly across the street to the ballpark, or simply love the game day atmosphere and fancy the idea of watching from your balcony, you can easily get in on all the action at 500 Crawford. Spacious downtown Houston apartment floor plans. 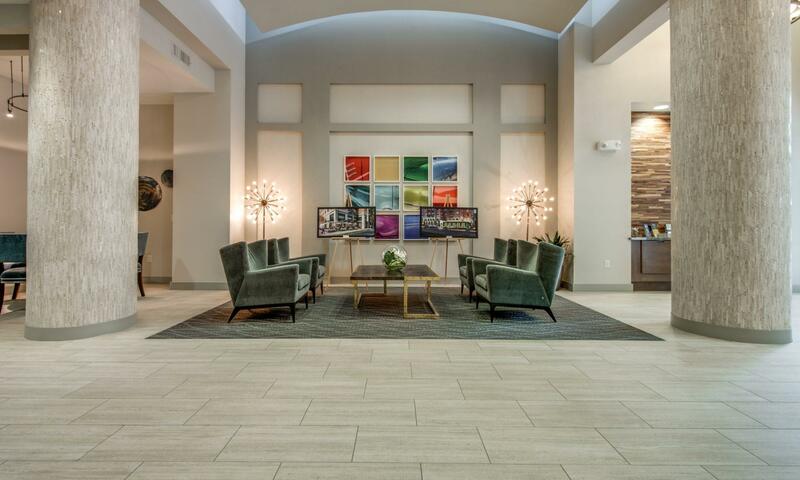 Whether you’re looking for a 1-bedroom or 2-bedroom floor plan, these Houston luxury apartments offer well-designed spaces for contemporary lifestyles. With bedrooms large enough to accommodate all your oversized furniture, ample storage space and walk-in closets, we make it easier than ever to make the move downtown. First-class amenities. We take immense pride in our amenities, because we know living in an upscale community with convenient and deluxe features such as having two on-site restaurants, lush landscaping to give a tropical oasis atmosphere along with a resort-style swimming pool, state-of-the-art fitness center with brand-new equipment and views overlooking downtown Houston and Minute Maid Park can make all the difference. Soundproof construction. What may not seem like a big deal to some of you is truly one of our top sellers, and goes beyond the beauty and design of our luxury midrise. Our 7-story midrise was built with 6-inches of concrete between each floor, and each home boasts 1-inch white oak stained premium hardwood floors. Other than being one of our most upscale in-home features, this provides a functional sound barrier from your neighbors. If you live stadium-side, your windows are triple pane glass to help eliminate noise (of course, you can just slide open your balcony door to hear the roar of Minute Maid if you’d like). Downtown Houston walkability. It’s no question our location is a top-seller. Downtown Houston always has so much to offer as the city’s urban hotspot for professionals and millennials. Walk to fascinating art installations, unique coffee shops, five-star restaurants, dive bars, concert venues, Discovery Green and more. On-site guest suite. This is definitely a first-class amenity we offer at 500 Crawford (see #3 for a few others), but it’s such a unique amenity, we wanted to call it out on its own. If you have in-laws or family coming in town and don’t want to cramp your style, we offer a beautifully appointed guest suite that can be rented out for a nightly rate. This adds a touch of class and convenience for our residents. State-of-the-art fitness center. Our brand-new fitness center has MATRIX cardio machines, free weights, TRX bands and more, but we also offer complimentary yoga to residents on Saturday mornings. If you’re not feeling the gym, of course you can go for a beautiful run around downtown Houston (see the walkability and livability of downtown in #5). This downtown Houston apartment gives you options when it comes to staying fit! On-site restaurants. One of the top amenities of these downtown Houston apartments is having not one, but two on-site chef-driven restaurants on the first floor. Residents enjoy frequent happy hours, brunches and more at Osso & Kristalla, a modern trattoria, as well as a sophisticated and authentic dining experience at Potente. Another bonus: residents can order poolside service from Osso & Kristalla, which makes pool day that much better! Both Houston restaurants are owned by Astros owner Jim Crane and have rave reviews. 6th floor sports lounge. You don’t have to be a sports fan to love living here, but we make it pretty easy and fun if you are. Sports fans can post up in our lounge that overlooks Minute Maid Park and the Astros scoreboard. Hang out on the balcony or in one of our relaxing chairs and invite friends over, because cheering with friends is always more exciting. Our staff. We know many places brag about their five-star service, but our leasing agents, managers and maintenance staff work hard every single day to make sure you live your best downtown Houston life. From helping make dinner reservations, delivering packages or simply providing sweet treats in the lobby after a long day, our staff does it all. And then some! Don’t miss our other downtown Houston blog posts to stay updated. If you’re looking for a new downtown Houston home, call us today at 713.222.0500 and ask about our current leasing specials. We invite you to tour our Houston luxury apartments today or take our virtual tour. CURRENT RESIDENTS: If you already love living in your downtown Houston apartment, be sure to refer a friend and get a major referral bonus. Simply tell a friend or family (or social media) that you love 500 Crawford, have them put your name on their lease, and you make fast cash (see leasing office for details).